Every year we’re late getting going on the vegetable garden. Something always crops up at the wrong time (but not veggie crops). But to be fair, there is only a short window of opportunity between the end of the ferocious Creuse winter and the growing season. I’ve heard that round here you’re crazy to even think of planting anything before March 17th since there can still be hard frosts. And there usually are. And since spring begins on April 1st, in my opinion anyway, you only have a fortnight to get the ground ready for planting. But today, while I was varnishing skirting boards in the gloom in the gîte, Chris was out in the sunshine on the tractor rotavating the vegetable patch. It was a dandelion field before, as you can see from the photo. 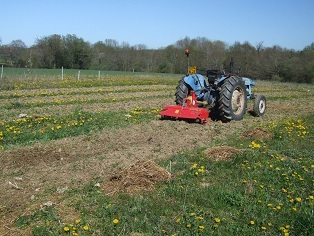 Chris has cleared four patches, each two-tractor-widths, with a good path inbetween. We didn’t factor in paths in previous years, and so often ended up treading on our precious veg. Live and learn. 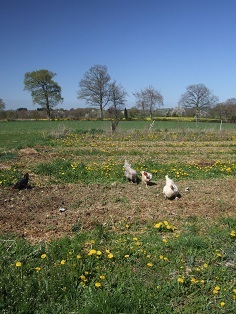 The chickens are busy on it now, rooting out leatherjackets and other undesirables before we start planting within the next week or so. We eagerly await our new polytunnel. We had a polytunnel disaster last year, as you may recall. We had a week of use from it before it was destroyed in a not-very-strong wind. ADD LINKS We have invested in a good, sturdy, 10 foot by 20 foot polytunnel from First Tunnels. It’ll be coming with all sorts of extras to keep it safely in place in even the strongest temp__ête. We’ve got off very lightly this year so far, so we’re pretty sure something will turn up sooner or later and rattle the roof for a day or two.